Roast chicken with Brussels Sprouts. Yes please! This dish is about comfort food. Nothing can beat the simplicity of a good roast chicken. Chicken with roast potatoes was a weekly staple in my household growing up. And like most Greek kids I gobbled it up and always declared it a “favourite”. There was something quite hypnotic and dare I say even intoxicating, seeing the chicken come out of the oven and being served up with piles of Greek style potatoes. This dish had plenty of Greek olive oil, oregano and lemon juice. As simple as this dish was I cannot begin to tell you how hard I found it trying to perfect a simple roast chicken. It would often end up dry or “not quite cooked”!!! I dabbled in brining a whole bird and had mixed success with that but sometimes, when the cravings kick in you just want to roast a chicken and be done with it. Which is the situation I found myself in recently. After returning from my “overindulgent” holiday I desperately wanted to step in the kitchen but wanted to keep it simple. Nothing too fancy. Just some roast chicken and veggies. I had bookmarked an inspirational article about roasting chicken and quickly went to work applying this technique. An hour and twenty or so minutes later, I was staring at the most delicious looking piece of roasted poultry! The recipe used butter, herbs and sea salt. It also required the oven to be kept at quite a high temperature. Now, this may not seem like rocket science to most of you but I’m used to cooking the majority of my roasts the Greek way – using olive oil. The butter had worked its magic producing a juicy and “moist” chicken. The combination of herbs added a subtle aroma. I avoided potatoes in this instance and used another one of my favourites. I added these in the last half hour and they come out crispy and full of flavour. 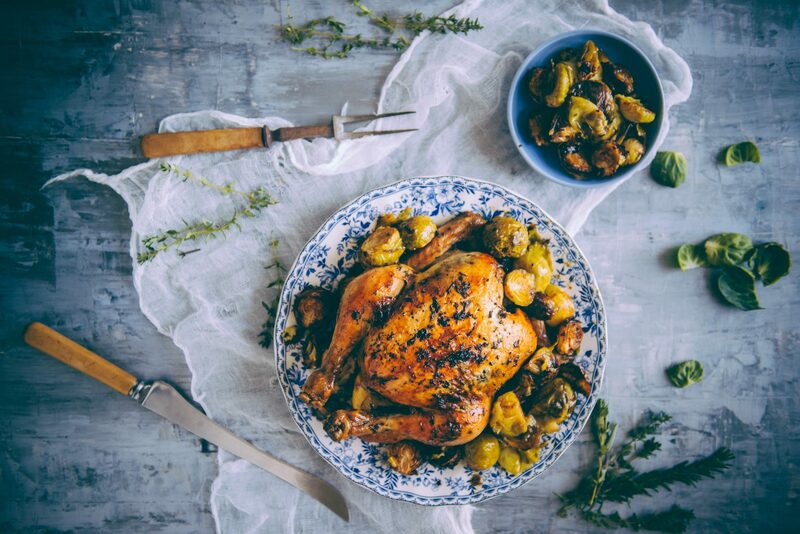 If you’re looking for something different withy your next roast chicken recipe I urge you to give this roast chicken with Brussels sprouts a go. Make this roast chicken with Brussels sprouts for your next dinner. With a good helping of butter and fresh herbs you can't go wrong. Adapted from here. Preheat your oven to 230 deg C.
Combine the butter, salt and herbs in a bowl. Mix well using a wooden spoon until all the ingredients are incorporated. Slide your fingers between the chicken skin and flesh to loosen the skin. Take a handful of the herby butter and spread onto the flesh (under the skin) ensuring it is spread quite evenly. Do this for all the chicken ensuring there is some to cover the the outside of the chicken as well. Sprinkle any leftover herbs over the top of the chicken. Pour the lemon juice over the chicken and tuck the lemon halves into the cavity. Place the chicken onto a baking tray and cook in the oven for 20 mins. Reduce the heat to 200 deg C and cook for another 30 mins making sure to baste halfway through. Scatter the brussels sprouts around the chicken and cook for another 30 mins until the chicken is golden. Allow to rest for 15 mins. before serving it up.